The snow’s getting deep now; it’s snowshoe weather for sure. I’ve been sorting through my pepper seeds as I’ll be starting them next week. I know it sounds early, but this year we’ll be setting them out earlier in our hoop houses. We want to be able to set out really sturdy plants that will get to producing earlier as some of our hot peppers have a long season to maturity. We’ll be planting some of them outside the hoop house as we really have too many to house inside now. In northern Minnesota, you need stocky peppers to help them make it outdoors. If you’d like more information on growing peppers, check out my article Growing and using peppers in issue #163, (January/February 2017) of Backwoods Home Magazine or The Twenty-Eighth Year Anthology. So far, I’ve got 26 different pepper varieties to plant. Some are old faithfuls and others are brand new to us. Growing heirlooms is so much fun! Good news! 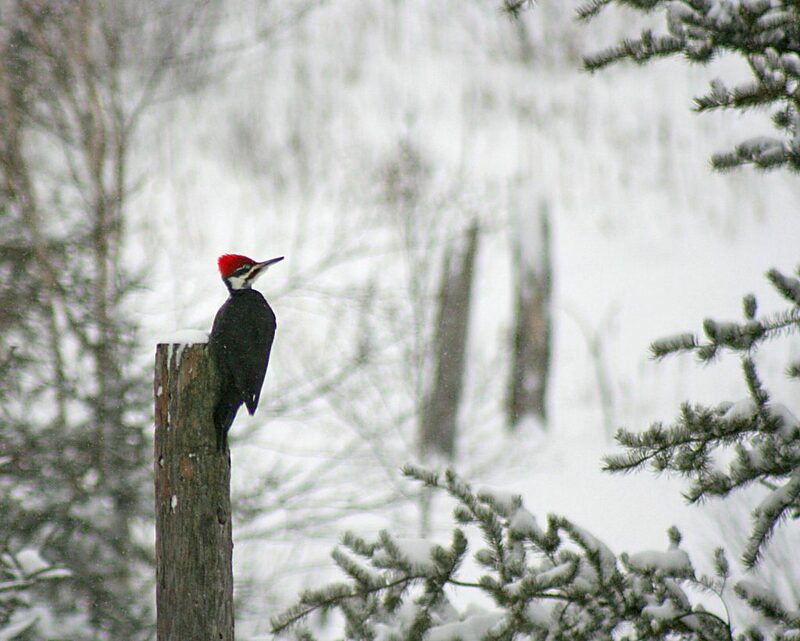 Our Pileated Woodpecker is coming around regularly now. I felt bad on Sunday when our friend Maggie, who attended one of our seminars, stopped by for a visit on her way to the Sax-Zim Bog for a birding trip. The woodpecker left only 15 minutes before she showed up. We did have a great visit though, and hope she saw the Great Gray Owl she was hoping to see. Our Pileated Woodpecker is now a frequent visitor! 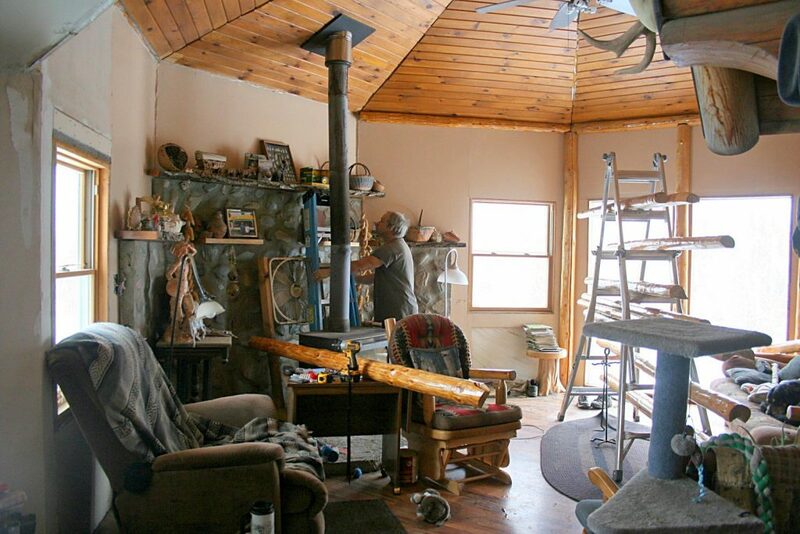 Will is busy putting up the log accent pieces in our vaulted living room ceiling. As it’s like a giant jigsaw puzzle, it’s taking some figuring. He numbered them but doesn’t remember the sequence! But it’s coming along and sure looks great. Will is busy screwing our log accent pieces up in the living room. He actually does. In fact, when I’m in bed I’m formatting the next adventure. Writing my Westerns is my ME time, sort of like when folks golf, sail or play tennis. I love the wildlife we have around us although because a pack of coyotes got into my poultry, killing most of the turkeys and all but 3 chickens, they’re NOT my favorites right now!!! No, the wild turkey hen and her daughter didn’t get killed; they roost high in the Jack Pines next to the storage barn. I’ve seen both Great Horned Owls and Barred Owls take prey on our driveway at night too. That’s pretty awesome! I love hearing them at night too. I can’t wait for the first peeps of the frogs!!! Come on spring! Jackie, Have you ever thought to make a calander from some of your pictures? Not really, but that’s a good idea, Nancy. Hi Jackie! I mentioned a few weeks back that our winter has been foggy and mild. Well the wonky wobbly jet stream took care of that! 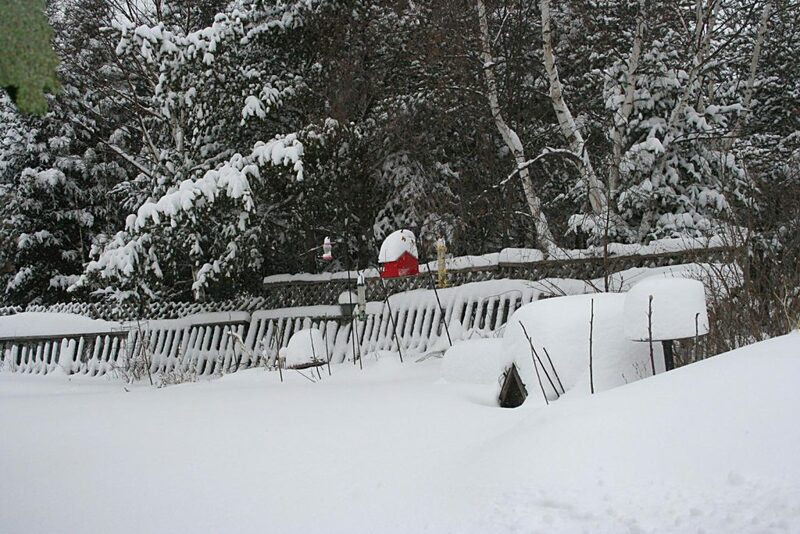 We’ve had snow and lots of it over a two day period-up to 30″ in some areas. Most schools closed and roads closed as well.These days you just never know what to expect! That’s for sure, Robyn! It seems there IS no “normal” weather anymore so we’ve just got to be ready as we can for anything. I think that trim looks great too. Catalog came yesterday! The room trim is looking great. Glad to hear the first wave of catalogs is getting to folks. We’ve also been sending lots from home, as well. Yeah, I know about peppers; I’m nearly ready to start mine too although I must warn others that in most climates, it’s still too early to begin starting them. I love your ceiling. and the photo of the P.
woodpecker is fantastic. I have seen one once. They kind of remind me of dinosaurs! When one flies overhead, you can hear the whoosh-whoosh of their wings. Neat! I got your catalog yesterday and was so excited that it finally came! We have three Pileated woodpeckers and I love to watch them go to work on stumps. They sound like jackhammers! Glad you got your catalog! Around here the Pileateds go for the carpenter ants which infest the bottoms of the balsams. They can excavate a huge hole in an hour or less. Jackhammers for sure! I recieved my seeds a few weeks ago, and will be glad to get some started. plenty of snow here too. I’ll be getting another seed order out. Yeah, the sun finally came out after we got dumped on by another 6″ of snow. Whew! I’ll be glad to see spring this year. Yes, this is our catalog for our Seed Treasures little homestead seed business. (You can click on the seedy Seed Treasures bar in this blog to see what we’re about and photos of our varieties.) No. There’s no charge for a catalog. Just e-mail me at jackieclay2007@yahoo.com and give me your address and I’ll pop a catalog right off in the mail. Received your catalog yesterday. Order placed in the mail today! Enjoy your articles and blog. Thank you Apollo! I’m glad to hear you like the articles and blog. All of you become like family to me. How do we order the seed catalog? janelle, for some reason, the reply doesn’t work!!! I’ll answer you in a comment box. Ah, we’ll try this!!! All you have to do is e-mail me at jackieclay2007@yahoo and give me your address. I’ll send a catalog right off to you in the mail. Or you can click on the Seed Treasures box above or go to http://www.seedtreasures.com and see color photos of most all we have to offer. I received your catalogue a few days ago and looked through it and highlighted what I want to order. Can’t wait to start some of the new seeds I ordered. Your ceiling looks fantastic and Will is certainly figuring out logs. We also are getting more snow. Aren’t you ready for spring, Kathy? I know I sure am. And looking at seeds makes it seem much closer for us! Yep he is! Just like a puzzle, the more pieces you put into place, the easier it gets! Lookin’ good Will! Got your catalog!! Fantastic!! Can’t wait to seriously sit down with a pen and start seriously studying it! Sidetracked by all the snow right now. Today it’s 12 inches and still snowing! Chickens said see you in about a month lady! Just bring food and water! Your ceiling looks great! Wouldn’t it be fun to go outside again with no boots and heavy coats?? I’m about ready for some more spring-like weather too! We got another 6″ following the 6″ the day before. But today the SUN is shining. Sigh. So nice!! Your living room ceiling is lovely! Thank you Diana. I think it is too!